S-Sarc+1 - $920.00, S-Sarc+2 - $945.00. 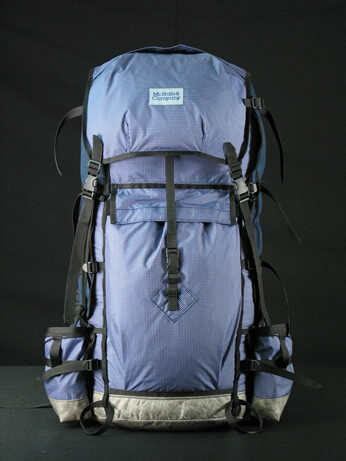 Higher volume top pockets, Kangaroos, Water/Wand pockets, and stiffer frames, taller hip-belts, characterize the UnLtd S-Sarcs. +3,+4,+5.....also available. 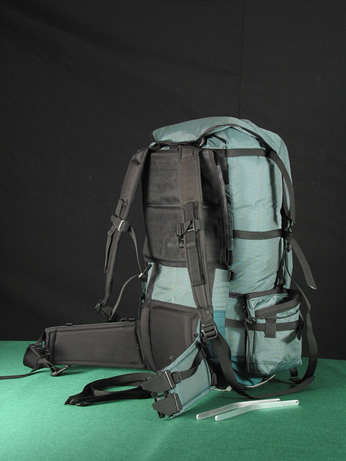 The UnLtd S-Sarc at right is a +2 with a full extension skirt, oversize kangaroo pocket, and oversize hip-pack top with bladder holder, which doubles as an extra clothing holder, 2 water bottle pockets, hipbelt pocket, and at 7,000 cuin weighs only 5.5 lbs. In different versions of 'summit mode' it is much lighter. 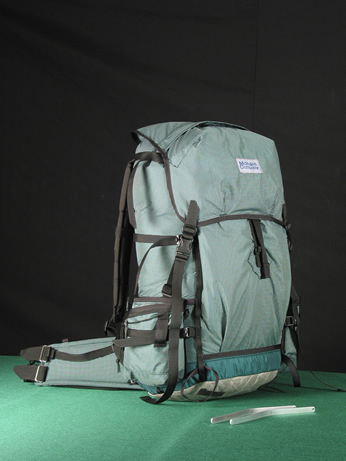 The oversize hip-pack alone weighs 13 oz. 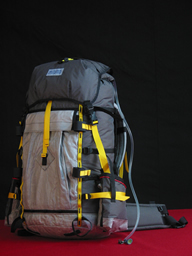 Removing the the hip-pack puts it in role-top mode and it's 4 lbs 11 oz.......and fully capable of 70 lb. loads. The 4lb. 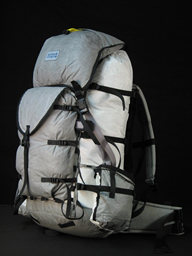 11 oz, weight even includes heavy duty stays so the sky is the limit when it comes to making these a bit lighter. Below: A partially dyed 100% Full Spectra+2 below. Click image to enlarge. Choose which parts you want made from Full Spectra to save money. 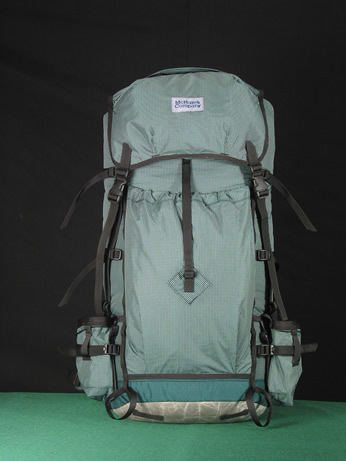 A Full Spectra Kangaroo Pocket is $75.00. 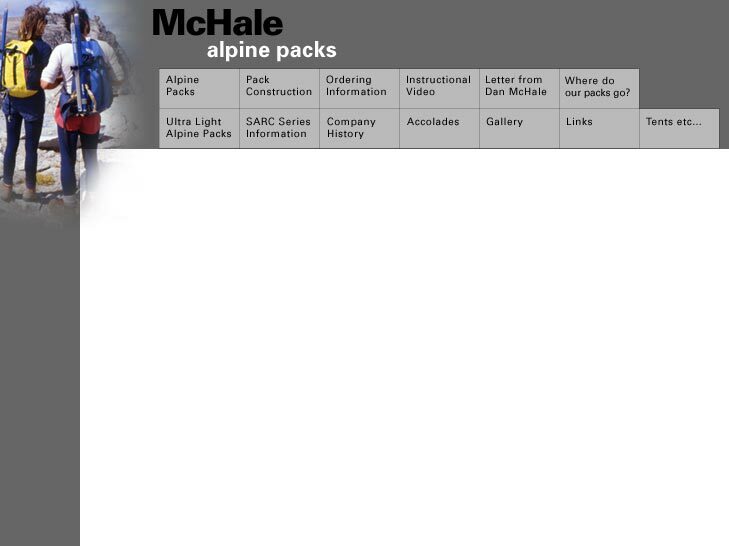 Pack below is an UnLtd +1. Click images for blowup. 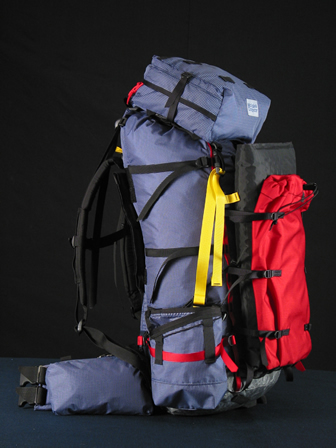 Larger volume packs are available for Larger Mountains and larger people! 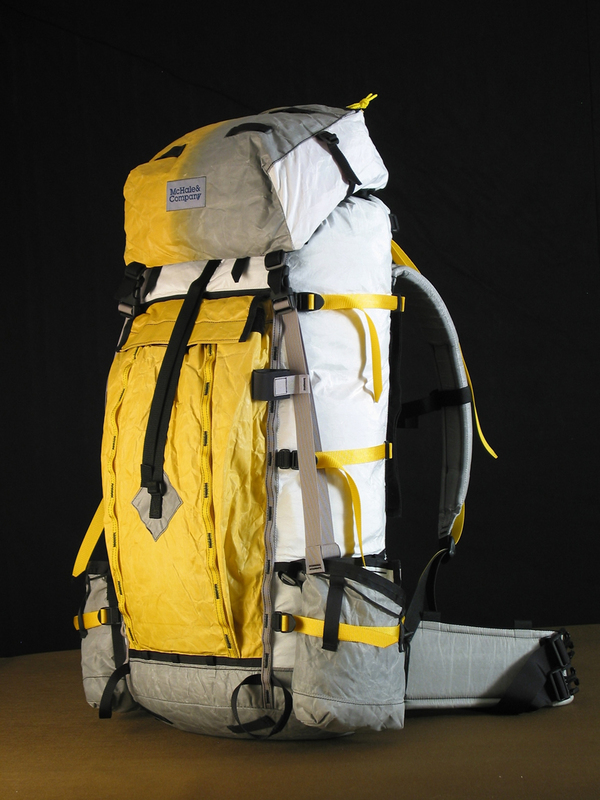 One way to bump the volume of one of these is with a set of our Super cargo pockets or Utility Pocket. 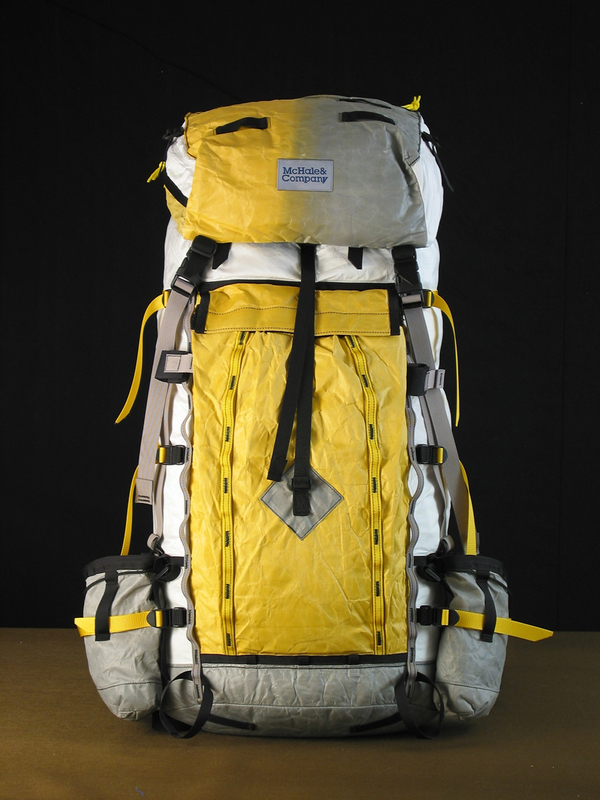 The lightest way to increase volume is with additions to the pack circumference. Add $75.00 for Full Spectra Kangaroo on non-full spectra packs. $75.00 for Full Spectra Shoulder Pads or $49.00 for body side only. 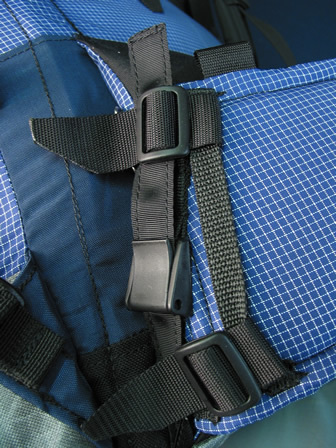 Below: Detail of bottom end of shovel utility pocket. 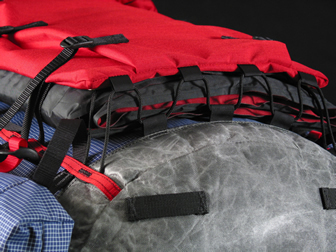 It will expand as much as needed drawsting draws inside of pocket through water drain holes. Click photo for spectra bottom detail also. Below: Full Bungy version. Bungy adjustments are inside the pouch and pass through grommetted drain type holes. 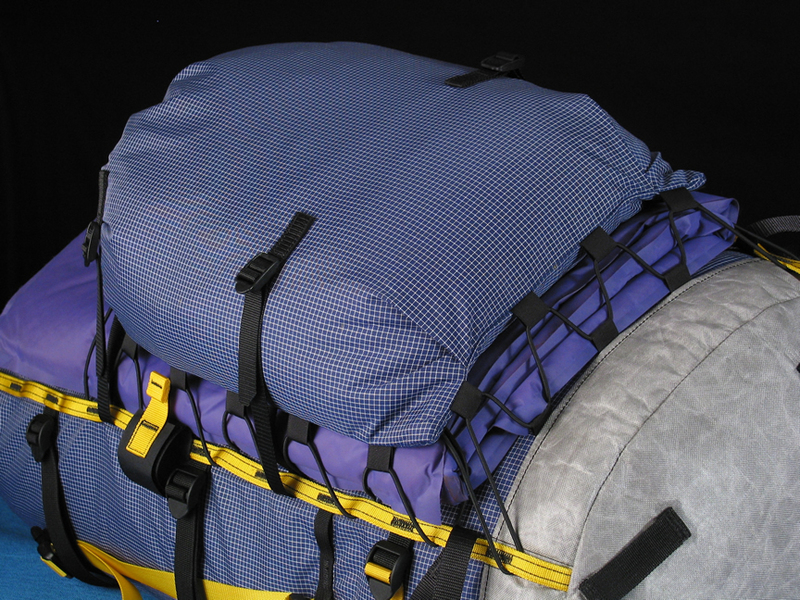 Shoulder straps for summit sack models will attach in the same way - through grommet holes. Pocket in this photo is easily holding an Integral Designs Primaloft jacket, a Lowe W/B parka, and a Merino Icebreaker pullover! Below: Our latest hipbelt/frame connector strap that locks with a cam buckle. Previous models were fitted with a velcro strap. Releasing the cam has the effect of providing a frame adjustment toward the shorter side by about 3/4" to 1" depending on the load. 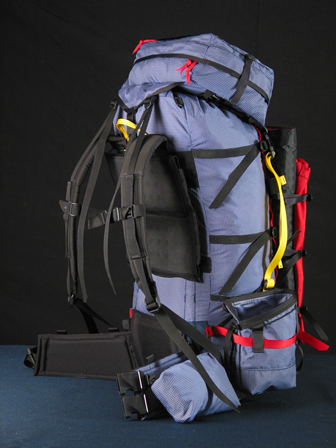 The belt can shift upward in relation to the frame when the strap is released. Prior models were fit longer to compensate for belt shift. 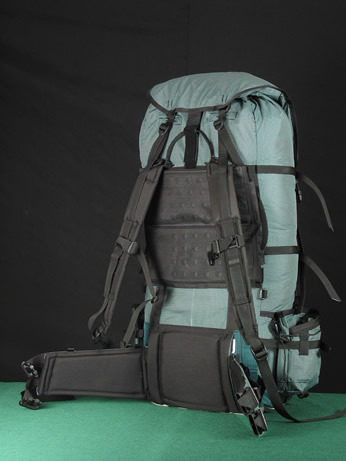 Q-Bayonet does the same thing on newest packs. Cam strap adds stability. It's primary function is to connect the hip-belt to the frame stays. 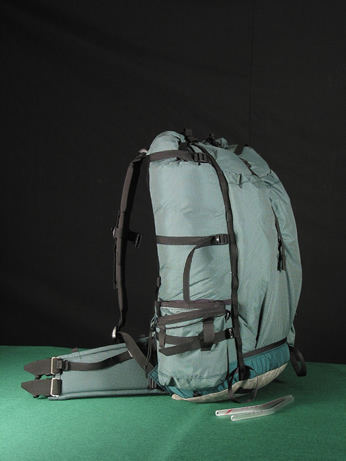 Other straps visible are excess strap length of the connecting straps folded over. 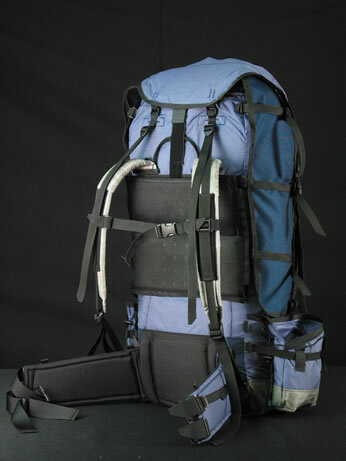 The stainless-steel buckles underneath that hold the straps and belt are not visible here. Similar UnLtd below but with a sewn Kangaroo pocket and 2 layer summit flap. 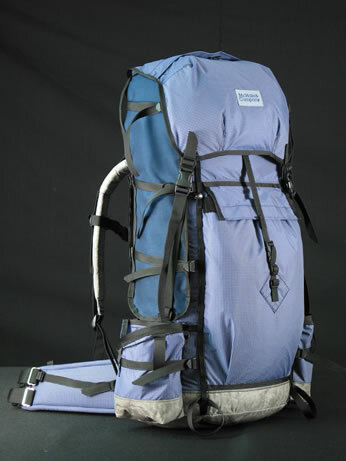 Removable ski guard panels are mounted on sides.